Anastasia is a 1997 American animated musical fantasy adventure film produced and directed by Don Bluth and Gary Goldman in association with Fox Animation Studios, distributed by 20th Century Fox, and starring the voices of Meg Ryan, John Cusack, Kelsey Grammer, Hank Azaria, Christopher Lloyd, Bernadette Peters, Kirsten Dunst, and Angela Lansbury. The film is a loose adaptation of the legend of Grand Duchess Anastasia Nikolaevna of Russia, which claims that she in fact escaped the execution of her family. Its basic plot centers around an eighteen-year-old amnesiac orphan named Anya who, in hopes of finding some trace of her family, sides with con men who wish to take advantage of her likeness to the Grand Duchess; thus the film shares its plot with Fox's prior film from 1956, which, in turn, was based on the 1955 play of the same name by Marcelle Maurette. Though it enjoyed a positive reception from many critics, the film was met with criticism by some historians for its fantastical retelling of the life of the Grand Duchess. From a $50 million budget, Anastasia grossed over $139 million worldwide, making it the most profitable film from Bluth and Fox Animation Studios to date. It received nominations for several awards, including for Best Original Song ("Journey to the Past") and Best Original Musical or Comedy Score at the 70th Academy Awards. The success of Anastasia spawned various adaptations of the film into other media, including a direct-to-video spin-off film, a computer game, books, toys and a stage musical, which premiered in 2016. In 1916, Saint Petersburg, Russia, Tsar Nicholas II hosts a ball at the Catherine Palace to celebrate the Romanov tricentennial. His mother, the Dowager Empress Marie Feodorovna, is visiting from Paris, France and gives a music box and a necklace inscribed with the words "Together in Paris" as parting gifts to her youngest granddaughter, 8-year-old Grand Duchess Anastasia. The ball is suddenly interrupted by Grigori Rasputin, a sorcerer and the former royal adviser to the Romanov family until he was exiled for treason. Seeking revenge, Rasputin sold his soul in exchange for an unholy reliquary, which he uses to place a curse on the Romanovs, sparking the Russian Revolution. During the siege of the palace, only Marie and Anastasia are able to escape with the aid of 10-year-old servant boy Dimitri, who shows them a secret passageway in Anastasia's bedroom. Rasputin confronts the two royals outside on a frozen river, only to fall through the ice and drown. The pair manage to reach a moving train, but only Marie climbs aboard while Anastasia falls, hitting her head on the platform and suffering amnesia. Ten years later, Russia is under communist rule and Marie has publicly offered 10 million rubles for the safe return of her granddaughter. Dimitri and his friend/partner-in-crime Vladimir search for an Anastasia look-alike to bring to Paris so they can collect the reward. Elsewhere, Anastasia—now 18 years old and going by the name of "Anya"—leaves the rural orphanage where she grew up, still suffering from amnesia. Accompanied by a stray puppy she names "Pooka", she decides to head to Paris, inspired by the inscription on the necklace she still has, but finds she is unable to leave Russia without an exit visa. An old woman advises her to see Dimitri at the abandoned palace, where he and Vladimir have made residence; there, the two men are impressed by her resemblance to the "real" Anastasia, and decide to take her with them to Paris. Bartok, Rasputin's albino bat minion, is nearby and notices his master's dormant reliquary suddenly revived by Anastasia's presence; it drags him to limbo, where Rasputin, slowly decomposing, survives. Enraged to hear that Anastasia escaped the curse, Rasputin sends his demonic minions from the reliquary to kill her; despite two attempts including crashing a train and tricking Anastasia into sleepwalking off a ship, the trio manage to (unwittingly) foil his plans, forcing Rasputin and Bartok to travel back to the surface. The trio eventually reach Paris and go to meet Marie, who has given up the search after being tricked by numerous imposters. Despite this, Marie's cousin Sophie quizzes Anastasia to confirm her identity. Though Anastasia offers every answer taught to her, Dimitri finally realizes she is the real Anastasia when she (without being taught to) vaguely recalls how he helped her escape the palace siege. Sophie, also convinced, arranges a meeting with Marie at the Palais Garnier Opera house. There, Dimitri tries to establish an introduction but Marie refuses, having already heard of Dimitri's initial scheme to con her. Anastasia overhears the conversation and angrily leaves. Dimitri drags Marie to see Anastasia, who regains her memories as they converse. Convincing the empress of her identity, the two are joyfully reunited. Marie offers Dimitri the reward money the next day, recognizing him as the servant boy who saved them from the siege; to her surprise, he refuses it and leaves for Russia. At Anastasia's return celebration, Marie informs her of Dimitri's gesture, leaving Anastasia torn between staying or going with him. Pooka suddenly runs off; Anastasia chases him to the Pont Alexandre III, where she is trapped and attacked by Rasputin. Dimitri returns to save her, but is soon injured and knocked unconscious. In the struggle, Anastasia manages to get hold of Rasputin's reliquary and crushes it under her foot, avenging her family as Rasputin disintegrates and dies. In the aftermath, Anastasia and Dimitri reconcile; they elope, and Anastasia sends a farewell letter to Marie and Sophie, promising to return one day. The couple are then seen kissing on a riverboat. Bartok shares a kiss with a female bat before bidding the audience farewell. Meg Ryan as Anastasia "Anya" Nikolaevna Romanova: Raised as an orphan, who at age eighteen sets out on a journey to discover her true heritage as the youngest daughter of the Romanov family, and Grand Duchess of Russia. Liz Callaway provides the singing voice for Anastasia. Kirsten Dunst and Lacey Chabert portrayed the speaking and singing voices for young Anastasia, respectively. John Cusack as Dimitri: A young con-man, a former servant of the Romanovs, and Anastasia's love interest. Jonathan Dokuchitz provides the singing voice for Dimitri. Glenn Walker Harris, Jr. provided the voice-over for young Dimitri. Kelsey Grammer as Vladimir "Vlad" Vanya Voinitsky Vasilovich: A former nobleman turned con-artist, and a friend of Dimitri. Christopher Lloyd as Grigori Rasputin: A dangerously evil, and power-crazed sorcerer who cast a curse upon the Romanov family that claims all but two of the lives of the royal family. Jim Cummings provides the singing voice of Rasputin. Hank Azaria as Bartok: Rasputin's accomplice and mild-mannered, talking, albino bat. Angela Lansbury as Marie Feodorovna Romanov: The Dowager Empress, mother of Nicholas II, and Anastasia's grandmother. Rick Jones as Nicholas II Romanov, the last Tsar Russian Emperor and Anastasia's father. Jones also provided voice-over work for the voices a Revolutionary Soldier, a servant, and a ticket agent. J. K. Simmons, Victoria Clark, and Lillias White were among the ensemble and character voices. In May 1994, The Los Angeles Times reported that Don Bluth and Gary Goldman had signed a long-term deal to produce animated features with 20th Century Fox with the studio channeling more than $100 million in constructing the animation studio. They selected Phoenix, Arizona, for the location of the new animation studio because the state offered the company about $1 million in job training funds and low-interest loans for the state-of-the-art digital animation equipment, with a staff of 300 artists and technicians, a third of whom worked with Bluth and Goldman in Dublin, Ireland, for Sullivan Bluth Studios. For their first project, the studio insisted they select one out of a dozen existing properties which they owned where Bluth and Goldman suggested adapting The King and I and My Fair Lady, though Bluth and Goldman felt it would be impossible to improve on Audrey Hepburn's performance and Lerner and Loewe's score. Following several story suggestions, the idea to adapt Anastasia originated from Fox Filmed Entertainment CEO Bill Mechanic. They would later adapt story elements from Pygmalion with the peasant Anya being molded into a regal woman. Early into production, Bluth and Goldman began researching the actual events through enlisting former CIA agents stationed in Moscow and St. Petersburg. Around this same time, screenwriter Eric Tuchman had written a script that co-screenwriter Bruce Graham described as being "very adult, very based in reality, all about politics, and without any magic or comedy". Eventually, Bluth and Goldman decided the history of Anastasia and the Romanov dynasty was too dark for their film. In 1995, Graham and Susan Gauthier reworked Tuchman's script into a lighthearted romantic comedy. When Graham and Gauthier moved onto other projects, husband-and-wife screenwriting team Bob Tzudiker and Noni White were hired for additional rewrites. Actress Carrie Fisher also made uncredited rewrites of the film, particularly the scene in which Anya leaves the orphanage for Paris. For the villains, Bluth also did not take into consideration depicting Vladimir Lenin and the Bolsheviks, and initially toyed with the idea of a police chief with a vendetta against Anastasia. Instead, they decided to have Grigori Rasputin as the villain with Goldman explaining it was because of "all the different things they did to try to destroy Rasputin and what a horrible man he really was, the more it seemed appetizing to make him the villain". In reality, Rasputin was already dead when the Romanovs were assassinated. In addition to this, Bluth created the idea for Bartok, the albino bat, as a sidekick for Rasputin. "I just thought the villain had to have a comic sidekick, just to let everyone know that it was all right to laugh. A bat seemed a natural friend for Rasputin. Making him a white bat came later - just to make him different." Composers Stephen Flaherty and Lynn Ahrens recalled being at Au Bon Pain in New York City where Rasputin and Bartok were pitched, and being dismayed at the decision to go down a historically inaccurate route; they made their stage musical adaption "more sophisticated, more far-reaching, more political" to encompass their original vision. Bluth stated that Meg Ryan was his first and only choice for the title character. However, Ryan was indecisive about accepting the role due to its dark historical events. To persuade her, the animation team took an audio clip of Annie Reed from Sleepless in Seattle and created an animation reel based on it which was screened for her following an invitation to the studio. "I was blown away that they did that", Ryan later confessed, and accepted the role. Before Ryan was cast, Broadway singer and actress Liz Callaway was brought in to record several demos of the songs hoping to land a job in background vocals, but were liked well enough by the songwriters that were ultimately used in the final film. Cusack openly admitted after being cast that he couldn't sing, in which his singing duties were performed by Jonathan Dokuchitz. Peter O'Toole was considered for the role of Rasputin, but Christopher Lloyd was hired because of his involvement with the Back to the Future trilogy. Bartok was initially written for Woody Allen, but the studio was reluctant to hire him following revelations of his relationship with his ex-partner Mia Farrow's adoptive daughter, Soon-Yi Previn. Martin Short was also considered, but Hank Azaria won the role ten minutes into his audition. The film score was composed, co-orchestrated, and conducted by David Newman, whose father, Alfred Newman, composed the score of the 1956 film of the same name. The songs, of which "Journey to the Past" was nominated for the Academy Award for Best Original Song, were written by Lynn Ahrens and Stephen Flaherty. The first song they wrote for the project was "Once Upon a December"; it was written during a heatwave "so [they were] sweating and writing winter imagery". The film's soundtrack was released in CD and audio cassette format on October 28, 1997. 20th Century Fox scheduled for Anastasia to be released on November 21, 1997, notably a week after the 1997 re-release of Disney's The Little Mermaid. Disney claimed it had long-planned for the 17-day re-release to coincide with a consumer products campaign leading into Christmas and the film's home video release in March 1998, as well continue the tradition for re-releasing the film within a seven- to eight-year interval. In addition to this, Disney would release several competing family films including Flubber on the following weekend, as well as a double feature of George of the Jungle and Hercules. As a response, Disney refused to advertise for Anastasia on the ABC program The Wonderful World of Disney, and banned its corporate sponsors from airing film clips during their television commercials. Commenting on the fierce competition between the two films, Disney spokesman John Dreyer brushed off allegations of studio rivalry, claiming "We always re-release our movies around holiday periods". However, Fox executives refused to believe Dreyer's statement with Bill Mechanic responding that "It's a deliberate attempt to be a bully, to kick sand in our face. They can't be trying to maximize their own business; the amount they're spending on advertising is ridiculous...It's a concentrated effort to keep our film from fulfilling its potential." Anastasia was accompanied with a marketing campaign at more than $50 million with promotional sponsors from Burger King, Dole Food Company, Hershey, Chesebrough-Ponds, Macy's Thanksgiving Day Parade, Shell Oil, and the 1997 U.S. Figure Skating Championships. Overall, the marketing costs exceeded that of Independence Day by more than 35 percent. For merchandising, Fox selected Galoob to license dolls based on Anastasia. Many storybooks adapted from the film were released by Little Golden Books. In August 1997, the SeaWorld theme parks in San Diego and Orlando featured a 40-foot-long, 20-foot-high inflatable playground for children called "Anastasia's Kingdom". On April 28, 1998, Anastasia was released on VHS and sold eight million units. On March 14, 2006, the film was reissued on a two-disc "Family Fun Edition" DVD with the film in its original theatrical 2.35:1 widescreen format. The first disc contained the film, an optional audio commentary from directors/writers Don Bluth and Gary Goldman, and bonus features. The second disc contained a making-of documentary, music video and making-of featurette of Aaliyah's "Journey to the Past", and additional bonus content. The film was released on Blu-ray on March 22, 2011.
Review aggregator website Rotten Tomatoes gives the film a score of 85% based on 52 reviews and an average rating of 7.1/10. The website's consensus reads, "Beautiful animation, an affable take on Russian history, and strong voice performances make Anastasia a winning first film from Fox animation studios." Roger Ebert of the Chicago Sun-Times awarded the film three-and-a-half out of four stars, writing, "The result is entertaining and sometimes exciting". The Cincinnati Enquirer described Anastasia as "charming" and "entertaining", concluding, "Anastasia serves up a tasty tale about a fairy-tale princess". Lisa Osbourne of Boxoffice called the film "pure family entertainment." Awarding the film three out of five stars, Empire's Philip Thomas wrote, "Historical inaccuracies aside, Anastasia manages to be a charming little movie". Several critics have drawn positive comparisons between Anastasia and the Disney films released during the Disney Renaissance, noting similarities in their story and animation styles. Marjorie Baumgarten of The Austin Chronicle awarded the film three out of five stars. Likening its quality to that of a Disney animated film, Baumgarten wrote that Anastasia "may not beat Disney at its own game, but it sure won't be for lack of trying". Baumgarten continued, "[t]his sumptuous-looking film clearly spared no expense in its visual rendering; its optical flourishes and attention to detail aim for the Disney gold standard and, for the most part, come pretty darn close". The Phoenix's Jeffrey Gantz jokingly stated, "[i]f imitation is indeed the sincerest form of flattery, then the folks at Disney should feel royally complimented by Twentieth Century Fox's new animated feature about Tsar Nicholas II's youngest daughter." Owen Gleiberman of Entertainment Weekly wrote, "Fox's challenge to the Disney empire is a beautifully animated musical". However, Gleiberman continued, "Anastasia has the Disney house style down cold, yet the magic is missing." Critical reception in Russia was also, for the most part, positive despite the artistic liberties that the film took with Russian history. 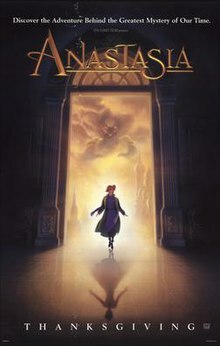 Gemini Films, the Russian distributor of Anastasia, stressed the fact that the story was "not history", but rather "a fairy tale set against the background of real Russian events" in the film's Russian marketing campaign so that its Russian audience would not view Anastasia "as a historical film". As a result, many Russians praised the film for its art and storytelling and saw it as "not so much a piece of history but another Western import to be consumed and enjoyed". Some Russian Orthodox Christians, on the other hand, found Anastasia to be an offensive depiction of the Grand Duchess, who was canonized as a new martyr in 1981 by the Russian Orthodox Church Outside Russia. Many historians echoed their sentiments, criticizing the film as a "sanitized, sugar-coated reworking of the story of the Czar's youngest daughter." While the filmmakers acknowledged the fact that "Anastasia uses history only as a starting point", others complained that the film would provide its audience with misleading facts about Russian history, which, according to the author and historian Suzanne Massie, "has been falsified for so many years". Similarly, the amateur historian Bob Atchison said that Anastasia was akin to someone making a film in which Anne Frank "moves to Orlando and opens a crocodile farm with a guy named Mort". Some of Anastasia's contemporary relatives also felt that the film was distasteful, but most Romanovs have come to accept the "repeated exploitation of Anastasia's romantic tale...with equanimity". A limited release of Anastasia at the Ziegfeld Theatre in New York City on the weekend of November 14, 1997, grossed $120,541. The following week, the wide release of Anastasia in the United States made $14.1 million (for an average of about $5,692 from 2,478 theaters), which placed it as the #2 film for the weekend of November 21–23, 1997. By the end of its theatrical run, Anastasia had grossed $58.4 million in the North American box office and $81.4 million internationally. The worldwide gross totaled up to about $139.8 million, making it Don Bluth's highest-grossing film to date and beating out his next highest-grossing film, An American Tail, by about $55 million. This was Don Bluth's first financially successful film since All Dogs Go to Heaven. Anastasia On Ice was a licensed adaptation produced by Feld Entertainment's on ice unit that ran from at least 1998 to 1999. In 1999 a direct-to-video spin-off and prequel called Bartok the Magnificent was released which focused on the character of Bartok. On April 21, 2015, Hartford Stage, Hartford, Connecticut, announced that they will premiere a new stage production of Anastasia, with the book by Terrence McNally, lyrics by Lynn Ahrens, music by Stephen Flaherty and directed by Darko Tresnjak. The production ran from May 13 through June 19, 2016. It is an original new musical combining both the 1956 Fox film and the 1997 animated film. According to Tresnjak, the musical features six songs from the animated movie and additionally includes 16 new songs. Additionally, there have been some newly rewritten characters including Checkist secret Police officer Gleb Vaganov (in the place of Rasputin), and Lily, who has been renamed in the place of Sophie. McNally said "This is a stage version for a modern theatre audience...The libretto's 'a blend' of old and new...There are characters in the musical that appear in neither the cartoon nor the Ingrid Bergman version." The Hartford production featured Christy Altomare as Anastasia/Anya, Derek Klena as Dimitri, Mary Beth Peil as The Dowager Empress Maria Feodorovna, Manoel Felciano as Gleb Vaganov, John Bolton as Vladimir, Caroline O'Connor as Lily, and Nicole Scimeca as Young Anastasia. The musical transferred to Broadway with much of the original Hartford cast, opening on April 24, 2017, at the Broadhurst Theater to mixed reviews. Anastasia received the Broadcast Film Critics Association Award for Best Family Film and was nominated for 7 others, including two Academy Awards in the categories of "Best Original Musical or Comedy Score" (lost to The Full Monty) and "Best Original Song" for "Journey to the Past" (lost to My Heart Will Go On from Titanic). The R&B singer Aaliyah performed her pop single version of "Journey to the Past" at the 70th Academy Awards. Academy Awards March 23, 1998 Best Music, Original Song "Journey to the Past"
For playing "Dowager Empress Marie Feodorovna". Golden Globe Awards January 18, 1998 Best Music, Original Song "Journey to the Past"
^ "ANASTASIA (U)". British Board of Film Classification. December 5, 1997. Retrieved March 19, 2013. ^ a b "Anastasia (1997) - Box Office Mojo". Box Office Mojo. Retrieved September 21, 2009. ^ "IGN: Anastasia: Adventures with Pooka and Bartok". IGN. Retrieved December 30, 2010. ^ Chatter, Rialto (July 28, 2012). "Exclusive: Crawford, Barrett, Halston, Page Join Tveit, Lansbury, Lazar in ANASTASIA Reading!". Broadway World. Wisdom Digital Media. Retrieved July 1, 2012. ^ "ANASTASIA Musical to Make World Premiere at Hartford Stage Next Summer; Darko Tresnjak to Direct!". Broadway World. Wisdom Digital Media. April 23, 2015. Retrieved April 24, 2015. ^ Hill, Jim (September 19, 2011). "Has Disney Been 'Lion' About Jeremy Irons' Singing Voice?". The Huffington Post. Retrieved June 7, 2013. ^ "Company Town Annex". Los Angeles Times. May 4, 1994. Retrieved November 4, 2015. ^ "Animated film a first for state". The Associated Press. Tucson Citizen. August 18, 1995. Retrieved November 4, 2015. ^ "Fox produces animated feature - with a difference". Lubbock Avalanche-Journal. April 22, 1997. Retrieved November 4, 2015. ^ Verniere, James (November 16, 1997). "High toon in Hollywood - Disney has long dominated animation, but with 'Anastasia,' Fox cuts in". The Boston Herald. Archived from the original (Fee required) on October 18, 2016. Retrieved November 4, 2015 – via HighBeam Research. ^ a b Kuklenski, Valerie (November 18, 1997). "Battle Royal for Animation Crew; 'Anastasia' Putting Fox In The Game". Los Angeles Daily News. TheFreeLibrary.com. Retrieved November 4, 2015. ^ a b c Schnurr, Samantha (November 20, 2017). "Once Upon a November: Behind the Scenes of Anastasia 20 Years Later". E! Online. Retrieved November 21, 2017. ^ a b Bitran, Tara (November 21, 2017). "'Anastasia' Was Originally Much Darker and Eyed Woody Allen for Role". The Hollywood Reporter. Retrieved November 21, 2017. ^ Lee Lenker, Maureen (November 21, 2017). "Anastasia composers tell the stories behind the film's most beloved songs". Entertainment Weekly. Retrieved July 17, 2018. ^ Vincent, Mal (November 22, 1997). ""Anastasia" Touching Off War New 20th Century Fox Film Threatens Disney's Hold on Animation Market". The Virginian-Pilot. Archived from the original on October 18, 2016. Retrieved November 4, 2015 – via HighBeam Research. ^ a b "How Ahrens and Flaherty Are Re-Envisioning Anastasia For the Stage | Playbill". Playbill. Retrieved January 14, 2017. ^ Pearlman, Cindy (November 16, 1997). "Like her characters, Meg Ryan is sweet, tart". Chicago Sun-Times. Archived from the original (Fee required) on October 18, 2016. Retrieved November 4, 2015 – via HighBeam Research. ^ Stark, Susan (November 21, 1997). "How Meg Ryan Learned To Sigh Like 'Anastasia'". The Detroit News. The Seattle News. Retrieved November 4, 2015. ^ Kim, Jae-Ha (December 28, 1997). "Voice in toon // Animation not new to Callaway". Chicago Sun-Times. Archived from the original (Fee required) on October 18, 2016. Retrieved November 8, 2015 – via HighBeam Research. ^ Lovell, Glenn (February 9, 2001). "John Cusack won't be an Oscar nominee again but he should be". Knight Ridder. Archived from the original (Fee required) on April 18, 2016. Retrieved November 8, 2015 – via HighBeam Research. ^ Ai, Tan Lang (November 3, 1997). "Mystique of 'Anastasia'". New Straits Times. Archived from the original (Fee required) on October 18, 2016. Retrieved November 8, 2015 – via HighBeam Research. ^ "Newman". MTV. Retrieved November 24, 2012. ^ "The Making of Anastasia: The Music of Anastasia". 20th Century Fox. Archived from the original on January 11, 1998. Retrieved December 30, 2010. ^ "Anastasia (Atlantic) - Original Soundtrack". AllMusic. Retrieved December 30, 2010. ^ Eller, Claudia (October 10, 1997). "Draw and Fire: Disney Flexes Financial Muscle to Protect Its Animation Turf". Los Angeles Times. p. 2. Retrieved November 4, 2015. ^ EW Staff (November 7, 1997). "World War 'Toon". Entertainment Weekly. Retrieved November 4, 2015. ^ a b Farhi, Paul; Salerno, Heather (November 21, 1997). "Animation's New Battle Lines; With 'Anastasia' Marketing Blitz, 20th Century Tries to Out-Fox Disney". The Washington Post. Archived from the original on October 18, 2016. Retrieved November 4, 2015 – via HighBeam Research. ^ Petrikin, Chris (August 26, 1997). "Fox's toon high noon". Variety. Retrieved November 4, 2015. ^ "Sea World Lands Movie Tie-in". Orlando Sentinel. August 2, 1997. Retrieved March 20, 2018. ^ King, Susan (November 18, 1999). "Sidekick Bat Spreads His Wings in 'Bartok'". Los Angeles Times. Retrieved November 4, 2015. ^ Simon, Ben (June 26, 2006). "Anastasia: Family Fun Edition". Animated Views. Retrieved November 4, 2015. ^ "Anastasia (1997)". Rotten Tomatoes. Flixster, Inc. Retrieved May 10, 2013. ^ Ebert, Roger (November 21, 1997). "Anastasia". Roger Ebert. Ebert Digital LLC. Retrieved May 10, 2013. ^ McGurk, Margaret. "Dancing around history". The Cincinnati Enquirer. news.cincinnati.com. Archived from the original on February 1, 2014. Retrieved May 10, 2013. ^ Osborne, Lisa (November 14, 1997). "Anastasia". Boxoffice. Boxoffice Media, LLC. Archived from the original on February 2, 2014. Retrieved May 10, 2013. ^ Thomas, Philip. "Anastasia". Empire. Bauer Consumer Media. Retrieved May 10, 2013. ^ Baumgarten, Marjorie (November 21, 1997). "Anastasia". The Austin Chronicle. Austin Chronicle Corp. Retrieved May 10, 2013. ^ Gantz, Jeffrey (November 20, 1997). "Anastasia". The Phoenix. The Phoenix. Archived from the original on April 3, 2013. Retrieved May 10, 2013. ^ Gleiberman, Owen (October 27, 1997). "Anastasia (1997)". Entertainment Weekly. Entertainment Weekly Inc. Retrieved May 10, 2013. ^ a b Saffron, Ingra (March 19, 1998). "A Cartoon 'Anastasia' Charms a New Russia / Bolsheviks Get Written Out". The Philadelphia Inquirer. p. A01. ^ Mattingly, Terry (November 29, 1997). "Upset about Anastasia's movie portrayal". The Dallas Morning News. Archived from the original on May 18, 2013. Retrieved August 9, 2012. ^ Holden, Stephen (November 14, 1997). "Film Review: A Feeling We're Not in Russia Anymore". The New York Times. Archived from the original on January 24, 2011. Retrieved December 31, 2010. ^ a b c Goldberg, Carey (November 9, 1997). "After the Revolution, Comes 'Anastasia' the Cartoon". The New York Times. Retrieved December 31, 2010. ^ Welkos, Robert W. (November 18, 1997). "Moviegoers Track 'The Jackal'". The Los Angeles Times. Retrieved June 7, 2012. ^ "Don Bluth Movie Box Office Results". Box Office Mojo. Retrieved October 5, 2018. ^ Hirsch, Deborah (March 12, 1999). "Anastasia: Legend, Fantasy On Ice". Sun-Sentinel. Retrieved August 8, 2015. ^ Jones, Chris (September 25, 1998). "'Anastasia' Impressive Bit Of Family Fare". Chicago Tribune. Retrieved August 8, 2015. ^ King, Susan (1999-12-10). "Bartok the bat flies solo in new movie". Chicago Sun-Times. ^ "The BFCA Critics' Choice Awards :: 1997". Broadcast Film Critics Association. Archived from the original on December 12, 2008. Retrieved January 7, 2014. ^ "Anastasia - Cast, Crew, Director and Awards". The New York Times. Retrieved January 7, 2014. ^ "Anastasia (1997) - Plot, Details & Awards". Moviefone. Archived from the original on January 8, 2014. Retrieved January 7, 2014. ^ "Remembering Aaliyah". BET.com. Archived from the original on August 28, 2009. Retrieved December 30, 2010.